School time for our puppies! Here is your first to-do list. The first task might sound a little silly for those with adult dogs, but in fact, it's never silly to make a recall even better! 3. sit on a floor and put a fist full of treats or dog's favourite toy right in front of their nose, wait till they stop sniffing and click for anything they try other than getting directly to the food/toy or staring at it. It's very important the dog understands staring at food/toy doesn't get him anywhere as it will later on allow you to work with food/toys in your hand without distracting the dog's focus from the job at hand. 4. find a box or a drawer that is as long as your dog and not too high and shape a dog to put 1-2-3-4 legs into it. 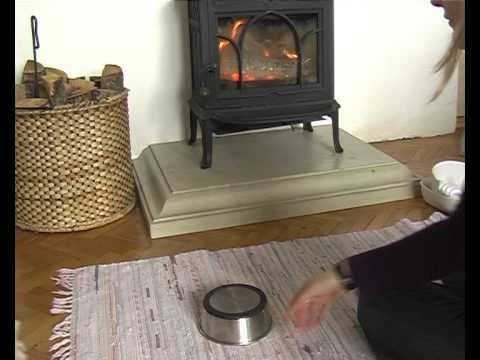 Then try with smaller&smaller objects, final goal is the dog can stand in a small bowl. 5. observe your puppy and see if he sometimes stretches his legs out when in down position, puppies often do that when relaxed or playing. Name it (I call it "frog":) and reward. It's a nice stretching exercise and very easy to get it on cue if the dog does it naturally (some dogs do it as adults too, but mine didn't and it was much harder to train it as with puppy Le who was doing that naturally). If not, put a dog in a down position and reward from the floor and so far ahead that the dog needs to stretch out to get it - but not so far that he would crawl ahead. Watch the hind legs and click for moving them back OR out, but NOT for crawling step forward. Looking forward to see your videos! Hey, my name is Birgit and i come form Denmark. I am joining a little late, but i will try to catch up. I have a 6 year old dansk- svensk gårdhund (danish breed) named Kitzi who i have been doing agility with up til last summer. The dog i will be training in puppy class is my 8 months old border collie named In- Joy. She is my first border collie and she is so much fun. I love working with her and i am trying to build up a strong relationship between us. My goal is to be doing agility competitions with her. I will post a video soon. This is my 2nd video for lesson 1. I am waiting for your comments to improve my handling. Phew…I think we finally have the frog legs. This was by far the hardest trick to train Elsa. I finally resorted to using a cushion and clicking for any backward movement with a hind foot. She knows how to “bow” and was offering this much of the time so I did put my hand (lightly) on her lower back in the beginning which helped a lot. Here is the video of her last training session. Now I need to fade the pillow but was wondering if I should add a cue first & then try for a frog without the pillow. Yes, you can definitely add a cue. To make fading the pillow easier, you can go to something even lower first, like a folded blanket or something -- should go really fast that way. Hey Cheryl, I wasn’t offended at all with your comments! I appreciate you taking the time to help me. Great job Carlos and Katrin! You seem to be pretty much done with this homework too! I see you’re getting really nice frog with great duration that way. Try to name it now so that you eventually don’t need your leg as a cue anymore, but can just tell him what you want. To keep you busy till Monday, you can also still go for an even smaller bowl -- as he can still sit in that one, it means he can still do a smaller one! Wow that is a super cute video! You guys did a great job! How do you all get your photo in the upper right of your comments? Nancy--when you are logged in you should see your name at the top left corner of the page. If you click on the arrow it should bring up a menu with “edit my profile”. This will take you to the page where you can upload your profile picture. Then click “save changes” at bottom of page. Hope this helps--good luck! Thank you for the comments! 🙂 We will certainly try a smaller bowl. Carlos is (luckily for me) a very food-motivated dog and it appears that he loves to learn new tricks. Sometimes, when he doesn´t get right away what I am after, he starts wimpering with frustration -- then I lower my criteria and reward rather rapidly. Hasn’t been able to video our progress since the last one. I’m concentrating on the 4 paws in the box trick and has just started on the paws on bowl trick. Nova finally gets the idea with shaping to put all her 4 paws in the box. We are progressing to a much smaller box soon. Sounds good! Getting them to offer behaviours can take even longer than that, so don’t get frustrated if she at one point goes into staring only again -- just get the action and go from there again. Wow we have learned a lot in this week. I’m obviously the weakest link on our team. Reading that article on the main page about playing with your dog helped me a lot. It’s amazing how easily I can forget why we are training -- to have fun! So now I am trying to play, throw treats, hold treats in my hand. Tibby is giving me her attention now! And we are having fun. Plate -- seems ok. I tried to use a cue for the one paw vs. two paw, but Tibby doesn’t get it get. More work needed. Box/bowl -- work in progress. I tried to go too fast, so we are going back to the beginning. I cut down the sides of our boxes. I think that helped some, but this needs more work. She keeps walking through the smaller box. When I wait for her to offer 4 feet in she gets frustrated and offers other tricks away from the box. Recalls -- we have been having a lot of fun with this! I didn’t think Tibby would ever choose to follow me if she had the choice. Well, she chose to follow me! In the video there is a loose dog running around in the park and Tibby doesn’t even care. And other dogs are her favorite thing. Frog -- I don’t think Tibby gets this. She doesn’t know what I’m clicking for. What do you think? We tried it with the pillow, but that just confused Tibby. Impulse control -- Work in progress. I tried it with Tibby’s favorite toy and steak. She eventually got it. 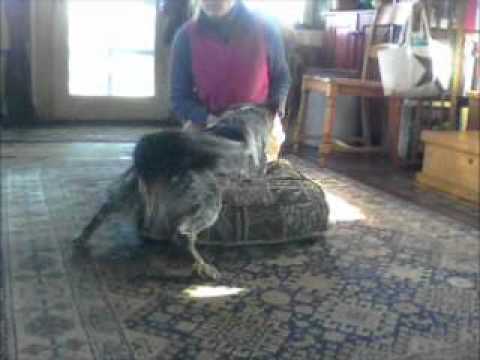 Same with frog: it is hard for the dogs to understand you might be clicking for hind legs if they weren’t clicked for hind legs before, so just take the time and let her figure it out: some other tricks for hind feet awareness that we’ll be working on in this class will help with it too. If you want to try on a pillow, you can tell her to lie down on a pillow, you don’t need to shape the down again if she knows it already -- that will allow you to focus on frog legs instead. For paw touches, it’s normal it takes some time for them to learn the verbal cues, but she is definitely offering the behaviors nicely, that’s the important thing! Recalls from a stay look great, try to slowly add difficulty by recalling also from sniffing etc. -- not when it would be too difficult, first when you see she has nothing else to do, then also from more&more distractions. Yes I don’t think she likes the bottles. I thought of using newspaper, but she LOVES to tear up newspaper and cardboard. I might try a rolled up blanket. This is Charm @ 6 mos. This video shows the progression of the larger and then smaller and smaller disc, then box, then bowls she learned to put 4 feet in. It also shows how she puts 2 feet on a round upside down bowl which I had already started teaching her per the Heeling video, prior to starting Puppy Class. I was marking and rewarding motion to both the left and right, but never getting a full 360 degree turn or even a 180 since I was marking both directions which confused her. Then I began only marking and rewarding rear foot movement to the left. You can see me struggling with the fact that I lure too much to try to help her understand. You can also see her wondering if perhaps she should be putting all 4 feet on the upside down bowl after all the 4 feet in the other box/bowls work. I know this is not part of the Puppy Class, but since it is what putting 2 feet on the plate is leading up to…is the goal to turn a full 360 degrees or is 180 degrees sufficient? What a cute puppy! Great job! For circling, we do need 360 degrees and the part when she is facing away from you is the most important part of it. At the beginning, I reward both directions and then switch to only rewarding one in order to get full circle. I wouldn’t lure her so much into it as she clearly doesn’t know how to reproduce it herself then. But do try to click&reward for any head turn away from you. Also, any time you reward, reward from the side, so that she is learning having her eyes off of you is perfectly o.k. -- that’s why getting full circle is so hard, especially with dogs who were rewarded for eye contact a lot.